I needed another one. 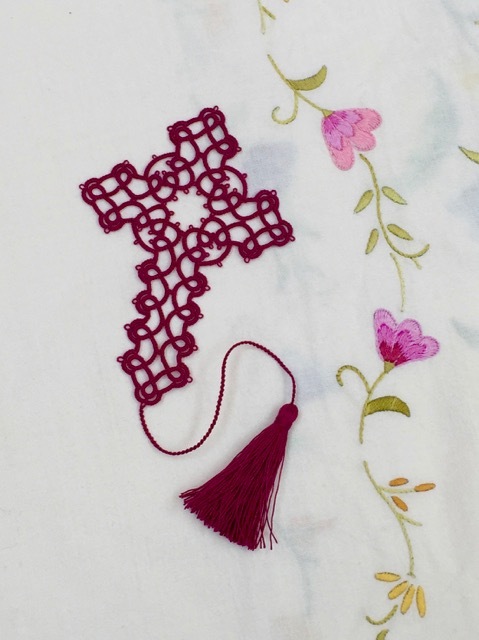 This time I made Mary Konior's small cross from the book "Tatting with Visual Patterns". It's quite a bit bigger than Elizabeth's small cross from two posts ago. Surprisingly, I had to adjust the pattern a little bit and made small changes because it wasn't working out quite right for me (just a stitch here and there). I like how it turned out. This cross has a very nice shape and I like the centre part which I find visually interesting where the three rings join together). And I had a sudden desire to try something new when I saw this bracelet (from a tutorial on YouTube)... 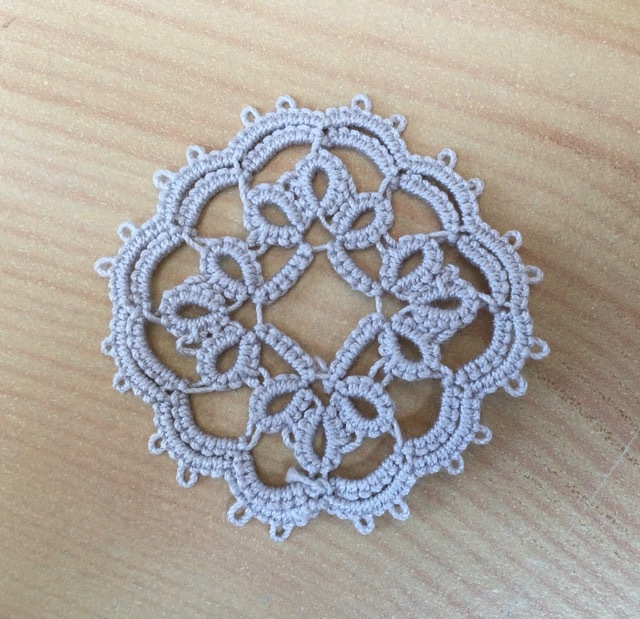 I had the materials so I gave "micro macramé" a go. 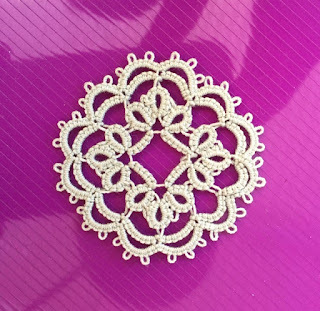 What's interesting is that if you look up close you will see that some of the stitches are just like tatting: the curves around the centre beads are done with "double stitches". 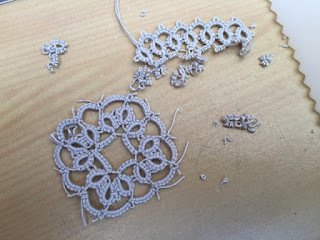 There is one row of plain ones and then two rows of "double stitches" interspaced with beads. 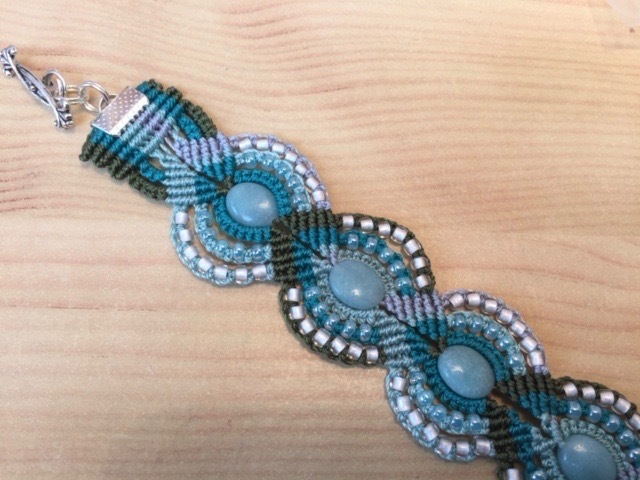 I'm waiting for a wider ribbon end as what I had was too narrow (where the clasp is attached to the bracelet). I enjoyed making it and will probably make another in different colours. I've also made progress on the projet from the previous post (one part is finished) but I'll wait to show you the completed thing. things just don't work out! I occasionally have patterns like that where I start to wonder if I was meant to make them. I started again on the little project from the previous post and went wrong again. 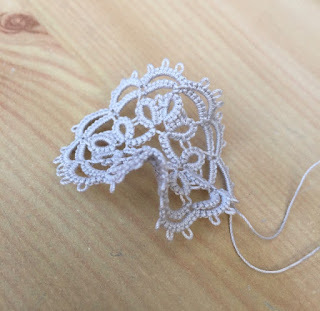 Well, the size of thread is better - surprising how much difference there seems to be between Lizbeth 20 and Anchor Artiste 20 but I managed to go wrong more than once while trying to re-make this. First of all the centre part wasn't lying flat at all - but that was stated in the pattern as it recommended pressing the piece after the centre part was made. Surprisingly, it did go completely flat. I just can't fit all the little rings in! chain of the previous round, not three!! the following round should work out better. So I'm afraid that's all I've got to show for so far. 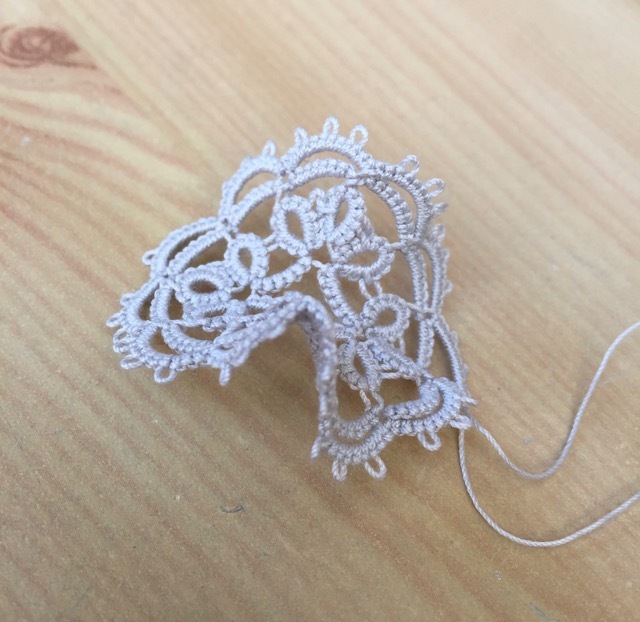 I thought I would be showing you the finished item in this blogpost but as you can see, I've been thwarted by my own incompetence! 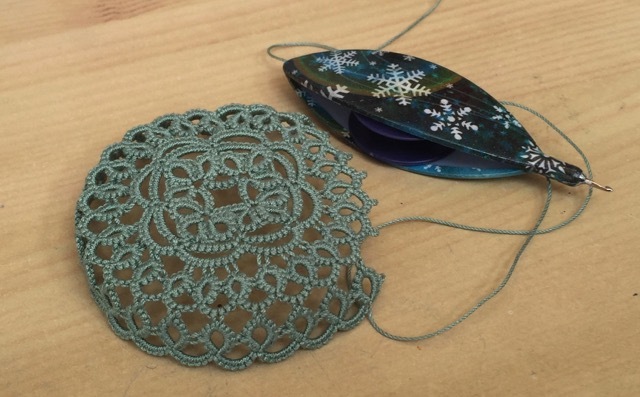 Still limited time spent on tatting by me at the moment. 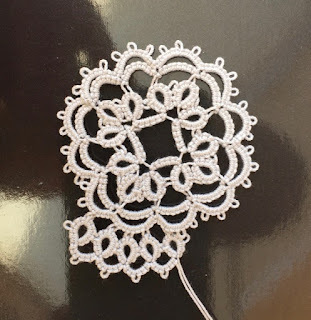 Here's the start of something which I will reveal in the next post... it's not quite working out at the moment and I may have to cut and re-tat! 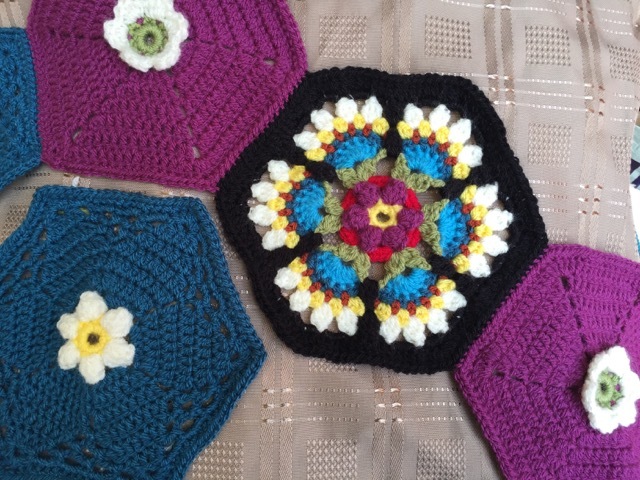 I've also made a start on the third element of the crochet-along blanket I'm making. Remember when I asked you whether I should go for cotton or wool? Thanks again for all your replies and votes for one or the other; I did go with wool (well, an acrylic blend) due to cost really. You need quite a bit of yarn for a blanket and I wanted to keep the cost down. I like natural fibres for clothing but I don't mind acrylic for blankets. The first motifs were the plum ones, then the blue ones and now it's this fairly complex flower that needs lots of colour changes! But it looks rather nice I think. This is a blanket inspired by Frida Kahlo and this latest motif is called "Bird of Paradise".